Are you considering buying a garden trampoline? If yes, then here are a few useful buying tips that can help you. 1. Will The Trampoline Be Used Or Will It Just Sit There? Every parent has a concern about whether or not the trampoline they buy will be used or not. Most Kids and some adults are always on electronic devices like smartphones and tablets. This addiction to electronic gadget leads to little or no physical exercise. A trampoline jumping is a great fun activity, so kids would love it. 2. Which Garden Trampoline Should You Buy? A Rectangular One Or A Circular One? Circular trampolines are the most common ones found in most gardens. They are also less powerful when compared to rectangular trampolines. A circular trampoline directs the jumper to the center of the trampoline mat, this makes it safer while you bounce. A rectangular trampoline could be dangerous for children to use, that is why it’s recommended to use a rectangular trampoline under supervision. 3. What Size Should You Go For? It’s important to measure the space you have in your garden to properly place the trampoline. Trampoline sizes in Germany are measured in Centimeters and inches. Sizes range from 183cm to around 490cm. You also need to allow at least 18 inches around the garden trampoline so that the safety net can flex incase the user falls against it. 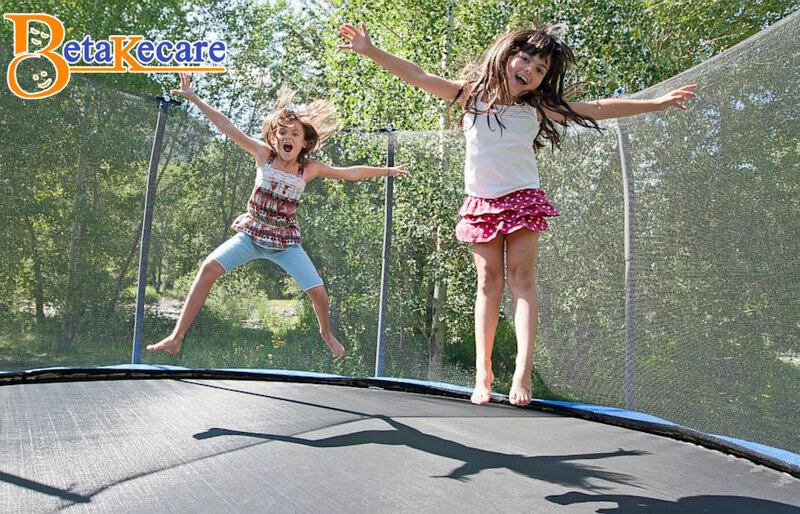 Always place the trampoline on a smooth surface and make sure there are no cables or tree branches nearby. It is always better to place the trampoline in an open space. 4. How Long Will They Last? Most trampolines last for a life time. The main part of the trampoline is its mat. The frame is usually made up of durable plastic or metal. 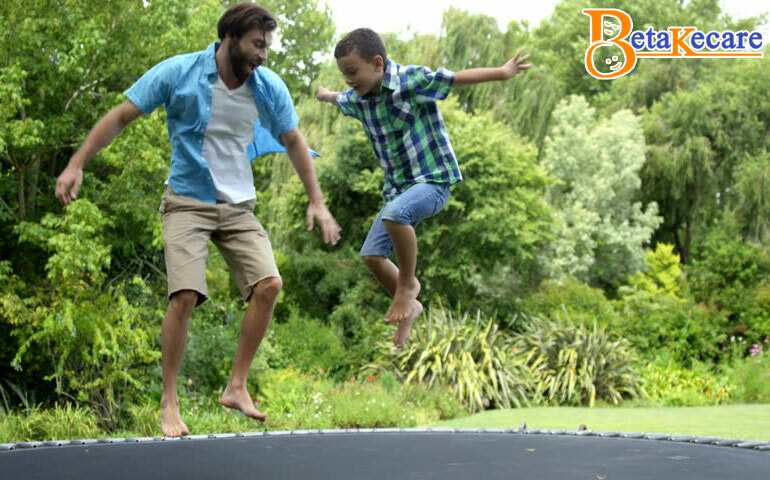 When buying a trampoline, keep in mind that it can be useful for your kids as they grow old. That is why it’s recommended to buy a big size trampoline. A garden trampoline is heavy and big in size. Most people that buy a trampoline need a special supplier that will deliver the trampoline. Most suppliers also help in assembling for you. Before you go to pick a trampoline, it’s better to go through a supplier, they help in guiding you on which type and size of trampoline to buy. 6. What Features Of Should You Look Out For When Buying A Garden Trampoline? The Frame is the most important part of the trampoline. Most trampoline frames are rust proof, this makes them very durable. Some trampoline frames are powder-coated, these kind of frames are not rust proof. The weakest part of the frame is where the circular rings join. The trampoline mat and spring padding need to be strong and of good quality. The trampoline mat needs to be smooth too, so that one does not get injured while they bounce. Number of springs are important too. Most manufacturers mention the number of springs they use for each size of trampoline. Larger trampolines have more springs and smaller trampolines have lesser springs. For an optimal bounce, the number of springs need to be related to the weight of the user. A trampoline with many springs may be too hard for children to bounce on. Specified weight limit in most garden trampolines is clearly stated. A 100kg weight limit is usually enough for most families. Also Read : Baby walkers: Did you know they are detrimental to your development? Safety Net: A safety net is a must have accessory. No matter what age you are, or how careful you are, a safety net is a must. A safety net protects you from falling off the trampoline. You will also need to a safety padding for the springs. A Ladder: A trampoline ladder is necessary as it allows you to easily access the trampoline. It is especially important if you have young kids that might want to climb up to use the garden trampoline. A ladder with flat steps is recommended because it is more comfortable for kids when compared to tubular steps. Protective Cover: A protective cover is a must have. This helps in keeping the trampoline clean when not in use. A protective cover helps in protection against leaves and dirt. You can also use it to cover the trampoline when going on a vacation. Trampoline tents are designed to sit on the trampoline like a dome. They can fold down like the roof of a convertible car. A trampoline tent is great if your kids want to sleep over on the trampoline. Before you buy a trampoline, be sure to survey the market. Check on various websites to buy a trampoline. Some trampoline dealers add a fixed price when delivering, while some add an extra price based on the weight. Also compare the prices of delivery services. It is always a good idea to keep the email or phone number of the retailer when buying a trampoline. This can come in handy if you need to make any inquiries. The benefits of using a trampoline are endless. It helps in improving your body and your posture as well. Previous articleHow does Detox Center Toronto work for their patients?